For this year's season of Xmas cheer, Dremel's new kits bring the opportunity to gift the fun of handicraft to the family in two very different presents. 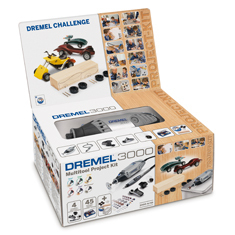 The Dremel 3000 Multitool Project Kit consists of a Dremel 3000 multi-tool, 45 accessories, four attachments including the Flexshaft, the Shaping Platform, Detailer's Grip and the Comfort Guard - and all the materials required to make a wooden car with the kids over the Christmas holiday. Simply unpack the set, make a drawing of your favourite car on the block of wood and cut out the shape with your Dremel 3000 and the spiral bit. Then fix the wheels to the axles that come with the kit and your model car is ready to race! Paint it for a bit more fun and add some detailing. The Dremel 3000 makes light work of precision cutting, sanding, routing, polishing and engraving. Switching accessories is fast and easy with the Dremel 3000 EZ Twist nose cap, an integrated wrench that enables you to change accessories without a spanner or key. Once Christmas is over, the Dremel 3000 will allow you to pursue your own projects all year round, especially those requiring an eye for detail, such as, precision grinding, sanding, cutting, polishing and engraving - whether these are hobbyist applications or for DIY in and around the house. 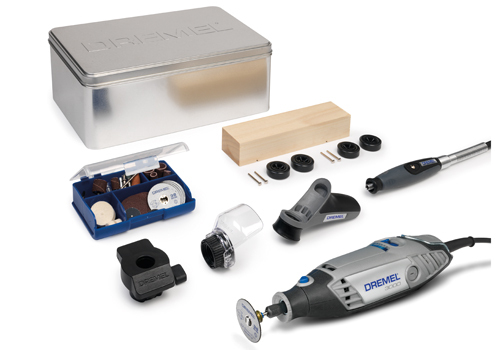 The Dremel 3000 Multitool Project Kit comes packed in a reusable tin storage case. 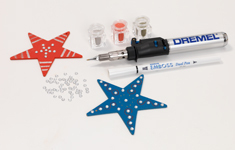 The Dremel VersaTip Decoration Kit provides the perfect gift for creative family members based around the Dremel VersaTip cordless soldering iron with its array of different tips - along with wooden snowflake and star shapes, an embossing pen, red, gold and silver embossing powder, and 70 hot fix rhinestones. Have fun making beautiful decorations to add to the Christmas tree, or to hang up against a window, or as a child's mobile, or simply propped up on a shelf in a family member's bedroom over the festive period. Just sprinkle the embossing powder onto the area where the embossing pen has been applied, shake off the excess powder and heat it up using the Dremel Versatip until it's liquid, then leave it to cool. Add sparkle with the pre-glued hot fix stones by heating the back of each with the Versatip and sticking them down. 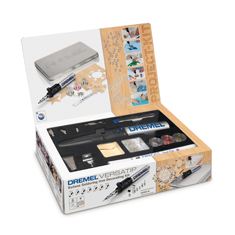 After Christmas, the six-in-one Dremel VersaTip is a hobbyist, crafter and model builder's dream tool. It solders, melts, hot cuts and welds. This handy and easy-to-use butane gas soldering iron comes into its own when there's detailed work to be done and it's easy to switch uses with the different tips included. 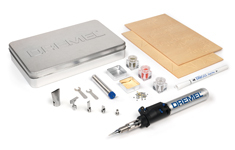 The Dremel Versatip comes with a soldering tip, a hot cutting knife, a heat deflector, a hot blower head, soldering tin and a flat wide flame head and is packed into a reusable tin storage case.